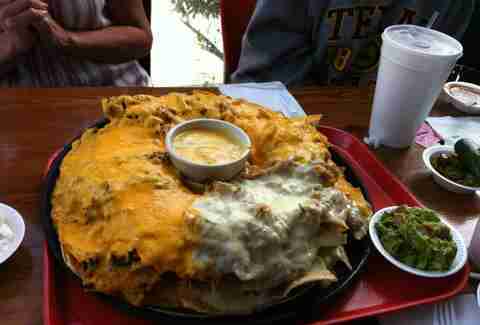 The Nancy Ames nachos are reason enough to visit this Tex-Mex institution. We’re not sure if the American folk songstress created or simply inspired the dish, but the spicy beef, beans, guacamole, cheese, diced tomatoes, and jalapeño-loaded chips make us love her as much as we love that guy Jose who created our favorite dip. 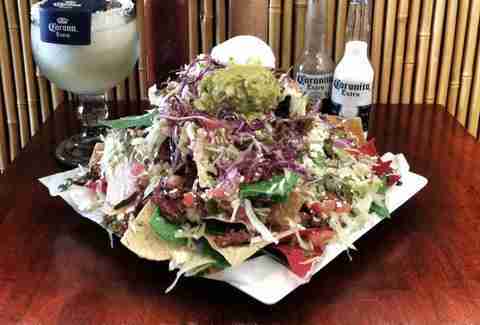 Pile-high nachos come in 1/4 or 1/2 plates, but we have no idea why you wouldn’t go for the full, save the fact that maybe you don’t want to get a heart attack today. 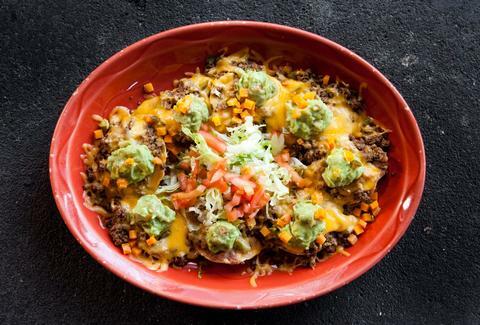 But if you do want one, go for the Monster Kong: a nacho variety plate stacked with an ungodly amount melted cheese; refried beans; chicken & mesquite beef fajitas; shredded chicken; picadillo beef; and a spread of spicy queso, sour cream, and guac. Monster Kong it is. 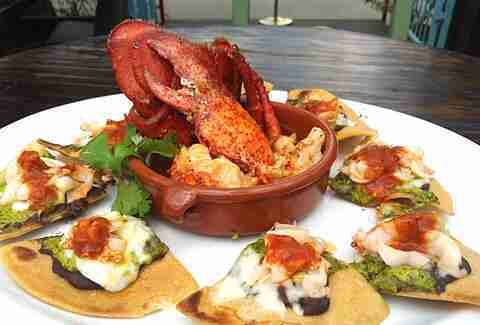 Obviously, the chicken & beef fajitas nachos at this Tex-Mex OG are awe-inspiring, but when Executive Chef Alex Padilla pulls out things like cheesy and decadent lobster nachos, it’s game-over. It doesn’t get more Houston than a Viet-Tex-Mex craft beer bar. It also doesn’t get more addicting -- because said Viet-Tex-Mex craft beer bar dishes out char-grilled pork-, pickled jalapeño-, and queso-coated nachos for you to gulp down with your brews. 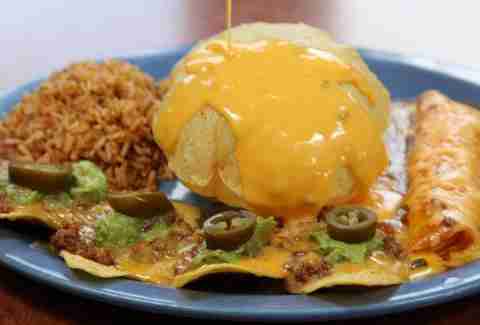 Clearly, this Tex-Mex newcomer cares for you deeply. That’s why it individually crafts each of its nachos to include asadero cheese, fresh jalapeño, black beans, pico, cilantro ranch -- plus smoked brisket, fried chicken, or fajitas -- on Every. Single. Bite. Home-style Tex-Mex means your nachos are loaded with classically delicious offerings like steak & chicken fajitas, beans, cheese, sour cream, guac, and jalapeños. 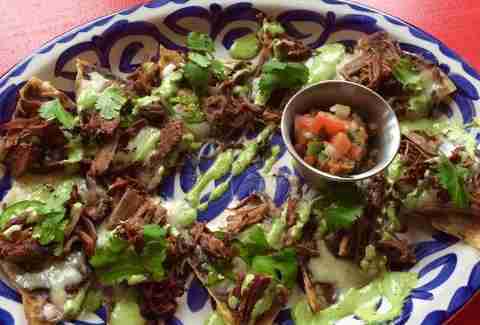 But we love the Nachos Rocio, where spiced ground beef adds a greasy, meaty punch. 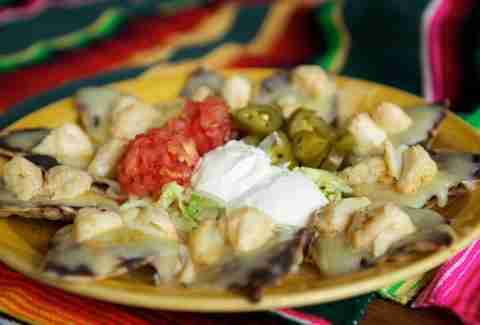 Refried black beans, gooey cheese, and tender jumbo lump crab meat top these individually constructed nacho masterpieces. They are like a work of art. A very cheesy and delicious work of art. Get your heaping plate of hot and beautifully greasy chips with a more-than-generous heap of steak, chicken, shrimp, pork, or crab (maybe they can do all? ), gooey chile con queso, black beans, corn salsa, pickled jalapeños, and sour cream & guac -- because they’re cool like that. 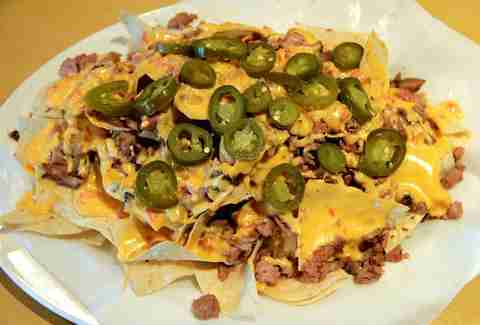 These are nacho mama’s nachos. 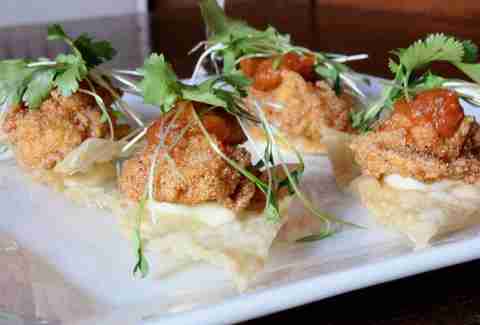 Unless your mama made nachos with slippery fried Gulf oysters, garlic aioli, habanero salsa, and hot & fresh wonton chips -- in which case, you have the best mom ever. Construct your own nacho masterpiece by piling on things like rotisserie chicken, steak fajitas, pork carnitas, queso, roasted corn relish, pico, olives, refried black beans, jalapeños, and -- screw it -- cilantro-lime rice. Why? BECAUSE YOU CAN. Loyal patrons know to order the off-the-menu special #15. Because when you can get your taco meat-, refried bean-, and chile con queso-loaded chips with a side of Mexican rice, puffy queso, and cheese enchilada, you do. Hot and freshly fried tortilla chips come fully loaded with an inhumane amount of queso, jalapeños, and your choice of lip-smackingly good BBQ chicken, pork, and brisket. You can also add sour cream. And you should. You always should. This nacho plate rises to a new level of brilliance thanks to Chihuahua cheese, marinated red onions, jalapeños, guacamole, refried black beans, and a gorgeous pile of cochinita pibil -- a traditional Mexican slow-roasted pork that is marinated in achiote paste before ending up all over your face. This taco-and-tequila joint tops its fresh-out-the-deep-fryer corn chips with the usual suspects, plus mouthwatering barbacoa, two types of cheese, and some more cheese in the form of QUESO. Therefore, we can only assume it loves you. With a laundry list of ingredients, including but not limited to roasted garlic aioli sauce; guac & sour cream; shredded pork, beef, or chicken; and three (three!!!) modes of cheese, these monster chip towers make the perfect companion to the tequila flights you’re for some reason doing after work on a Tuesday. Worth it!